Your opportunity to own nearly new (2016) in Dilworth Southend for under 1 million! 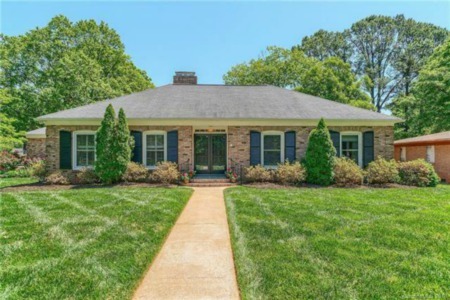 This custom home has 4 bedrooms, 3 full baths, fireplace and hardwood floors throughout. An open floor plan with 10' ceilings on the first floor and 9' ceilings on the second floor. Gorgeous kitchen with Custom cabinetry, quartz countertops, stainless steel Kitchenaid appliances. Master bath has designer touches including stand alone clawfoot tub and walk in shower with His and Hers closets. Laundry on second floor. Large detached garage with fully fenced backyard, fire pit and custom patio. Irrigation in front and rear. Additional yard space behind garage for playhouse or gardening. This portion does not have irrigation. The most walkable spot to southend dining and breweries. Just like new only you don't have to wait to build! Directions:Heading from south Blvd take Iverson way. Home on the right. SchoolsClick map icons below to view information for schools near 400 Iverson Way Charlotte, NC 28203. Home for sale at 400 Iverson Way Charlotte, NC 28203. Description: The home at 400 Iverson Way Charlotte, NC 28203 with the MLS Number 3467680 is currently listed at $950,000 and has been on the Charlotte market for 88 days. You are viewing the MLS property details of the home for sale at 400 Iverson Way Charlotte, NC 28203, which is located in the Dilworth subdivision, includes 4 bedrooms and 3 bathrooms, and has approximately 2391 sq.ft. of living area.